Vilnius, capital of Lithuania is located in the eastern part of the country, away from the sea and near the border with Belarus. The town originated in the fourteenth century and was surrounded by walls with towers and gates at the beginning of the sixteenth century. In 1579 there was founded the university, the city became more and more beautiful and attractive becoming an attractive cultural and commercial center for a wide area. 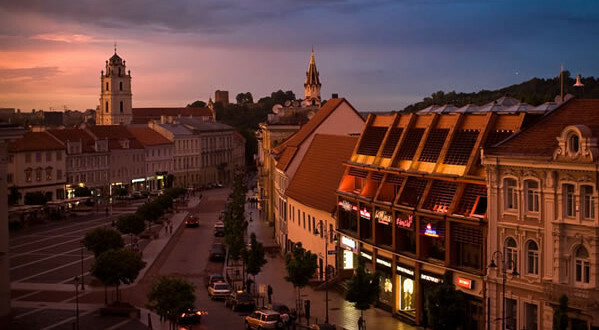 Vilnius was the political center of the Grand Duchy of Lithuania from the thirteenth to the eighteenth century. At the mid-seventeenth century, however, Vilnius was sacked and destroyed by the Russians. At the end of the eighteenth century it was finally annexed to the Russian Empire. Today, the historic center of Vilnius is characterized by a medieval structure and many fine buildings in Gothic, Renaissance, Baroque and classical styles, and for this reason the city has been included in the UNESCO world heritage sites. 1) Vilnius Christmas Market (Kalėdos Sostinėje). The market, or rather, the Christmas fair in Vilnius fills, with its 48 wooden stalls, the Cathedral Square (Katedros aikštė) in the historic center of the capital of Lithuania. In this Christmas market will be proposed local crafts (ceramics, glass, jewelery and other handmade Christmas gifts), Christmas decorations and delicacies of local cuisine (sweet chestnuts, gingerbread, mulled wine, artisan breads). You will also be waiting for Santa Claus with his reindeer. A large Christmas tree – 25 meters high and decorated with lights flashing LED – will be set up in Cathedral Square and in Town Hall Square there will be an ice skating rink. At the same time, the lights and festive decorations will create the typical Christmas atmosphere on the streets of the city of Vilnius. Finally during the Christmas season in the historic center of Vilnius will be able to attend the new magical Christmas Tale in 3D (3D Kalėdų Pasaka) and take a train ride with the Christmas Train (Kalėdų traukinukas) and experience the true spirit of Christmas. Throughout the festive season, Vilnius Cathedral Square will host a truly magical Christmas Market – buy a unique gift, treat yourself to a delicious festive treat or warming drink, or even meet a character from your favourite fairy tale. Come and experience the real joy of Christmas! Those with an appetite will be able to try various culinary, honey, cheese or chocolate treats. Those who will be on a gift hunt will be able to find special candles, amber or ceramics jewelry, woolen socks and other chrismassy products. Even small souvenirs wrapped in a festive package will make exceptional gifts. Here the evenings will be cozy sweet and warm.